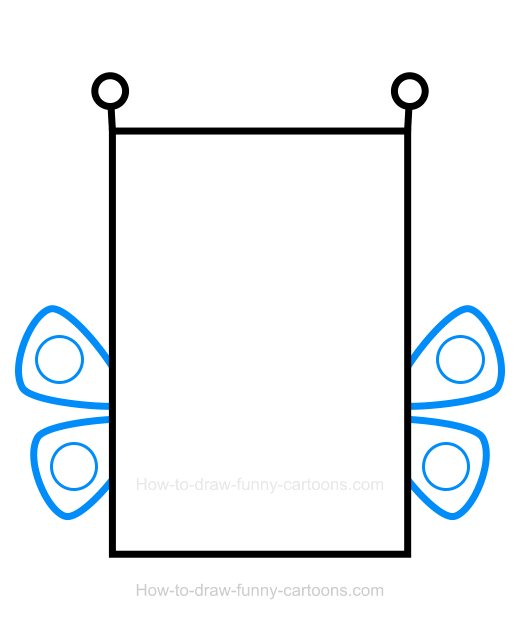 Draw a simple butterfly clipart using this step-by-step drawing lesson created especially for beginners! 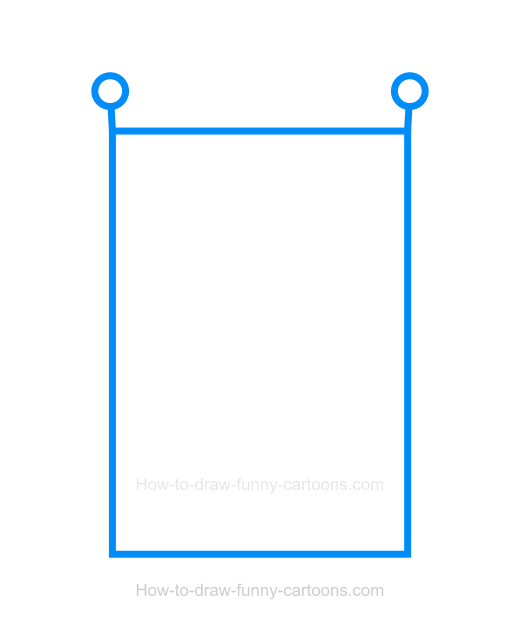 Indeed, all steps required are quite easy to duplicate once you are able to draw simple rectangles and circles (which should be already the case). 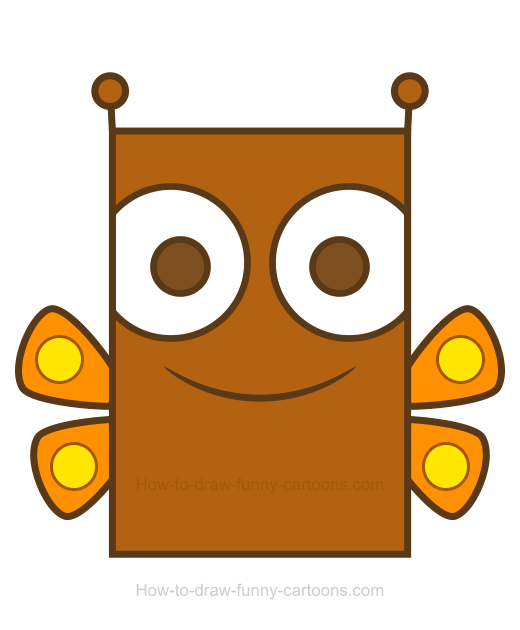 You can either create this cartoon character using a vector application or do everything with a pencil and a piece of paper. You can find the final version of this cartoon animal below. As you can see, this one is pretty basic to achieved. Of course, you can modify colors and shapes to create an original version not found on this page. Ready? Let's start this lesson now! 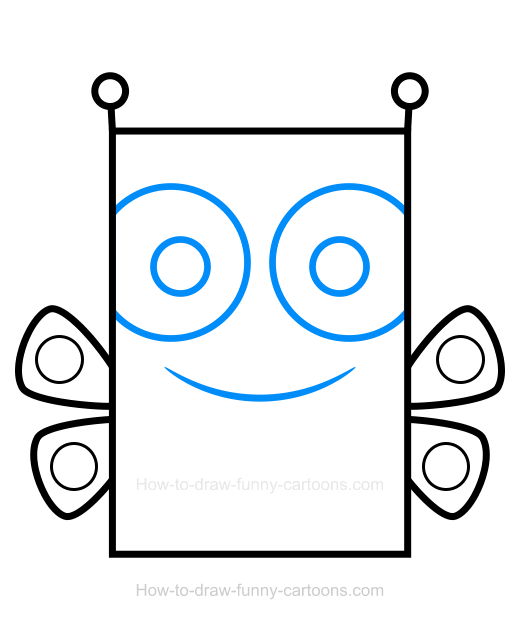 First, sketch a large rectangle to form the body of this cartoon butterfly. On top of this one, you can add two small lines and circles to create the antennas. All shapes done so far must be created using thick outlines. Once you are finished, you can proceed with the second step. On both sides of the body, you can draw wings using long curved lines. The wings on top can be slightly larger. Inside all four wings, you can draw small circles as shown below. These small circular shapes can have thin outlines instead of thick ones. Great! We are almost done (I told you it was simple and easy!). Inside the body and head, you can sketch large circular shapes to form the eyes. These eyes are partially hidden on both sides of the body. The pupils are done using smaller circles. Finally, you can create the mouth using a long pointed line. Now that the animal is over, it's time to add plain colors inside the illustration. The head and body can be filled with a dark brown color. Pupils are also brown, just like the antennas. All four wings can be colored in orange while round patches are filled with a bright yellow color. 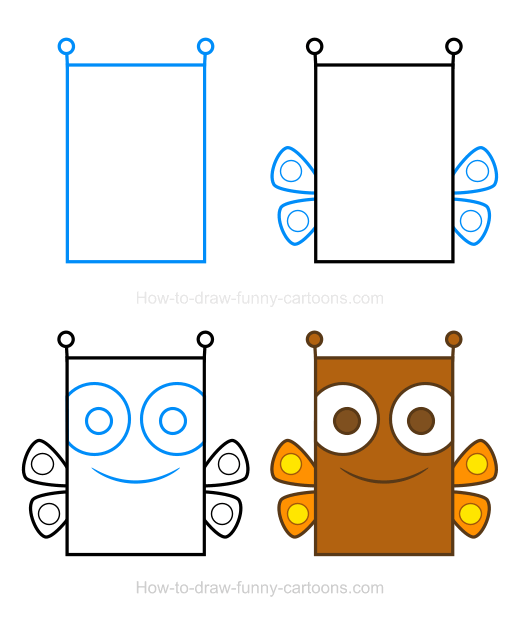 This is how you can create a simple butterfly clipart!